This recipe is a cross between eggplant Parmesan and lasagna, so it's pretty much one of the tastiest things ever. Roasted eggplant subs in for the noodles in a typical lasagna, which adds an extra step --but it's totally worth it! I've used ground turkey here, but you can definitely substitute in ground beef or meatloaf mix if you prefer, or even leave the meat out all together for a vegetarian version, since there's plenty of cheese for protein. 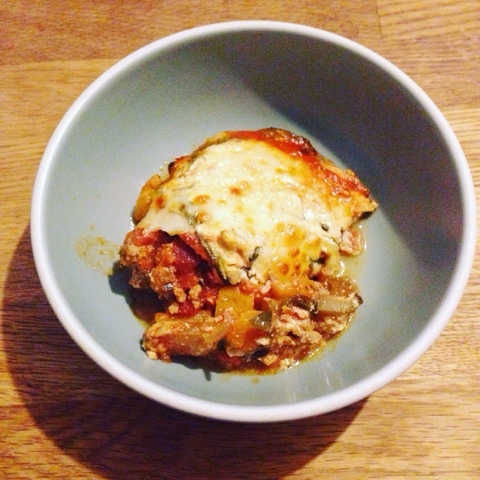 Leftovers reheat just as well as traditional lasagna, so this is a good one to take in for lunch and be the envy of your office! 1. Preheat the oven to 375 degrees and line two baking sheets with foil. Spray with oil. 2. Arrange the eggplant in a single layer on the baking sheets. Spray with a light layer of oil, and sprinkle with a little salt. Roast 15 minutes, and then set aside. 3. Meanwhile, start on the turkey sauce. Heat a generous drizzle of oil in a large Dutch oven over medium-high heat. Add the onion and saute for about 5 minutes, until softened. Add the bell pepper and garlic, and saute for another 3-4 minutes. Finally, add the turkey and cook until it is no longer pink. 4. Stir in the diced tomatoes, tomato paste, and water. Mince about 8 basil leaves, and add them to the pot, along with the oregano, salt, and fennel seeds. Bring to a simmer, and simmer 10 minutes or so. 5. In a separate bowl, stir together the ricotta, egg, and Parmesan. 6. When the turkey sauce is done, remove from the heat and stir 1/2 cup into the ricotta mixture. 7. Assemble the lasagna. Spray a 9x13 baking dish with oil. Spread half the turkey sauce in the bottom of the dish. Top with half the eggplant slices, and then spread with half the ricotta mixture. Sprinkle half the diced mozzarella evenly on top. Then repeat the layers (meat sauce, eggplant, ricotta, fresh mozzarella). 8. Spray a piece of foil with oil, and cover the lasagna (foil side down). Bake 40 minutes. Remove the foil, and place the lasagna under the broiler until the cheese is golden and bubbly. The timing for this will depend on how hot your broiler is -- the original recipe suggests 5-10 minutes, but mine would have become blackened lasagna if I'd left it longer than a couple of minutes, so check early and often! 9. Let sit for 5-10 minutes before serving. This is a great holiday dish that makes the typical scalloped potatoes (already one of my favorite-ever dishes) a little extra special with the addition of thinly sliced butternut squash. Cooking the potatoes and squash together before layering them in the baking dish ensures that they're fully cooked with no crunchy bits where there shouldn't be. This makes a big baking dish, so it will serve a crowd and would be great to take to a potluck. You can change up the cheese if you like, but I highly recommend using smoked paprika here -- it adds a lovely depth of flavor. 1. Preheat the oven to 400 degrees and spray a 9x13 baking dish with oil. 2. Combine all of the potato-squash mixture ingredients in a large soup pot. Bring to a boil, and then simmer 8-12 minutes, until the potatoes are just tender. 3. Meanwhile, melt the butter for the filling in a large skillet. Add the alliums, and cook over medium heat until nicely softened and browned. Sprinkle with salt and pepper to taste. 4. In a separate bowl, toss together the Cheddar, parsley, and paprika. 5. Layer half the potato-squash mixture into the baking dish. Scatter the browned alliums and cheese mixture on top, and then add the remaining potato-squash mixture. 6. Stir together the topping ingredients in a small bowl, and sprinkle over the top of the potatoes. 7. Bake until bubbly and browned, uncovered, 25-30 minutes. 8. Let the dish sit, uncovered, for at least 10 minutes before serving. This allows the liquid to thicken slightly. My husband and I had our honeymoon in Italy, and one of our favorite parts of the day was sitting in a cafe for an afternoon Spritz. Although most parts of Italy are hard to bring back to the states, the spritz is easy to make and the flavor totally transports me back to our trip. You can use any number of bitter orange aperitifs in a spritz (for many, many options, check out this excellent little book), but I've found that Aperol is fairly easily available and affordable. 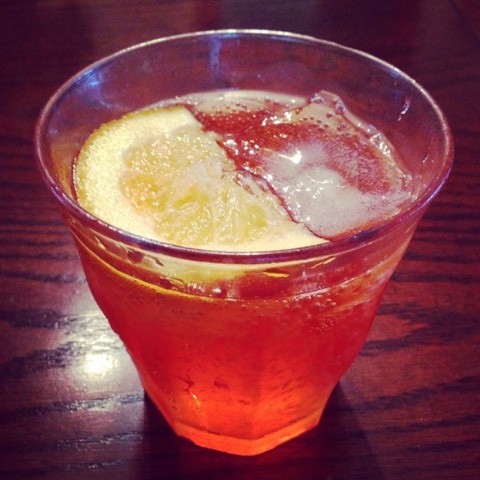 Aperol's bitter flavor and bright color are what make the spritz distinctive, while Prosecco and soda water add bubbles. The alcohol content is lower than many other liquors, making this a great afternoon or pre-dinner drink, or for anytime when you're more interested in something that feels a bit fancy than in something that will get you tipsy. Start with a few ice cubes in your glass. Add the Prosecco, top with Aperol, and finish with a little soda. Garnish with orange. Of course, you can adjust the ratio of ingredients to taste. I got the Seven Spoons cookbook for Christmas last year, and this is one of my favorite recipes from it. 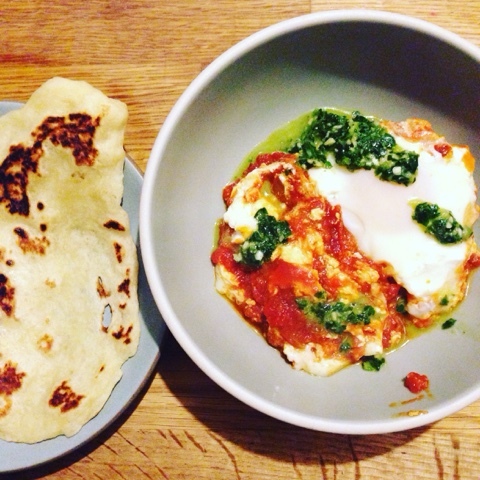 It's very similar to shakshuka, but with Indian flavors in the sauce and a bright chutney on top. Simple canned tomatoes are spiced up with cumin, garam masala, and chili flakes, and then swirled with creamy yogurt and goat cheese. You can cook more or less eggs in the sauce depending on how hungry you are and how saucy you'd like the final dish to be. The chutney is easy to make and definitely necessary to brighten up the richness of the eggs and sauce. You'll want something carb-y on the side to soak up all the sauce -- while rice or pre-made naan will do the job just fine, this dish is really something special if you make your own naan, and it's easier than you might think. The recipe linked to below is more authentic, but you can also cheat with no-knead naan, as I often do...it's still miles better than anything you can get pre-packaged. 1. Heat a large ovenproof skillet over medium-low heat. Melt the butter, and then add the cumin seeds. Saute, shaking the pan often, until fragrant, about 1 minute. Add the onions and cook until golden brown, 10-15 minutes. 2. Add the garlic and cook for another couple of minutes, stirring often. Sprinkle with a bit of salt, and then add the garam masala, coriander, turmeric, and chili flakes. Stir constantly and toast for 30 seconds. 4. Pour in the tomatoes and add the bay leaf. Raise heat to bring the sauce to a boil, then reduce heat to a simmer. Let simmer about 20 minutes, stirring occasionally. Taste and season with more salt as necessary. 5. Dollop the yogurt into the sauce and use a spoon to marble the two together slightly. Crack an egg into a small bowl. Use the edge of the bowl to make a depression in the sauce, and carefully slip the egg into the gap. Repeat with the remaining eggs. Top with crumbled goat cheese. 6. Move the pan to the hot oven. Bake, uncovered, for 12 minutes for a set white and fluid yolk. Be careful not to overbake, as the eggs will continue to cook a bit in the hot sauce even after you remove the pan from the oven. 7. Serve with green chutney and naan. Combine the ginger, garlic, jalapeno, salt, and sugar in a mini chopper. Pulse until everything is finely chopped. Add the cilantro, parsley, and lime, and pulse again to chop the herbs. Finally, add the olive oil and process until everything is finely chopped and comes together into a sauce. Taste and add more salt and/or lime juice as needed. 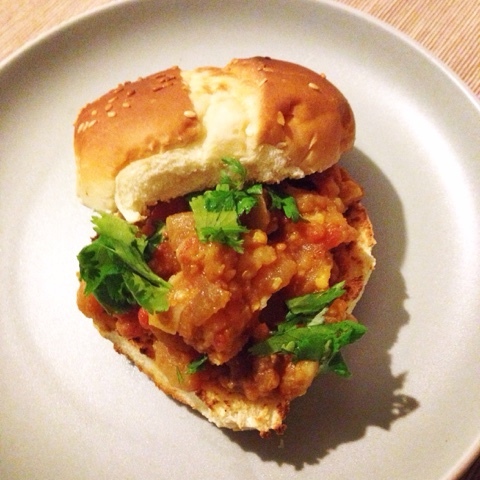 This dish sort of reminds me of a vegetarian, Indian version of sloppy Joes. 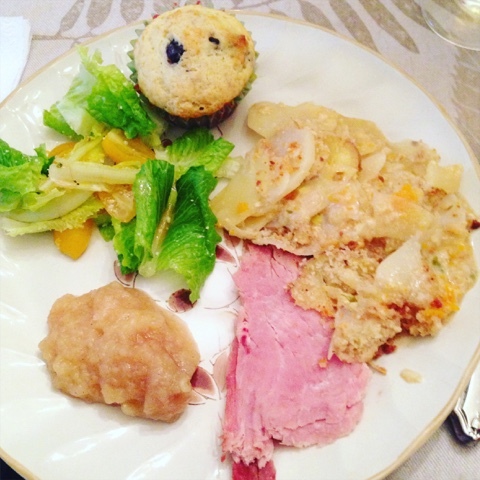 It's got that same savory, rustic quality, although the vegetable filling does take a little longer to cook. The time is totally worth it though -- the filling is rich and perfectly spiced, and pairs wonderfully with buttered rolls. Lemon juice and cilantro brighten up the dish and really make it sing. Leftovers reheat well. 1. Chop the potatoes into chunks, and boil until tender (10-15 minutes). Drain, mash, and set aside. 2. Melt the butter in a large skillet. Add the onions, and stir until softened and golden, around 25-30 minutes. Add the garlic and ginger, and cook for a minute or so. Add the eggplant and cover. Stir occasionally for about 10 minutes, until softened. Add the tomatoes, cauliflower, and tomato paste. Cook for 5-7 minutes, covered, until everything is nicely combined. Add more water if needed to get the mash to a loose consistency. 3. Add the spices (cumin, coriander, salt, garam masala, and turmeric), along with the reserved mashed potato. Stir everything together and cook, covered, for 10 minutes or so. 4. Use a potato masher to mash everything together, adding more water to get the consistency you want -- up to your taste, but you want something between mashed potatoes and thick pasta sauce. Finally, add a pat of butter and stir into the mash. Taste and adjust seasoning. 5. To serve, toast the rolls and spread with butter. Add a scoop of the mash, and then top with cilantro and squeeze lemon juice over everything. This is another great winter salad. It's not the prettiest to look at, since all the ingredients except for some fresh herbs are either white or beige. But, what it lacks in curb appeal, it more than makes up for in flavor! 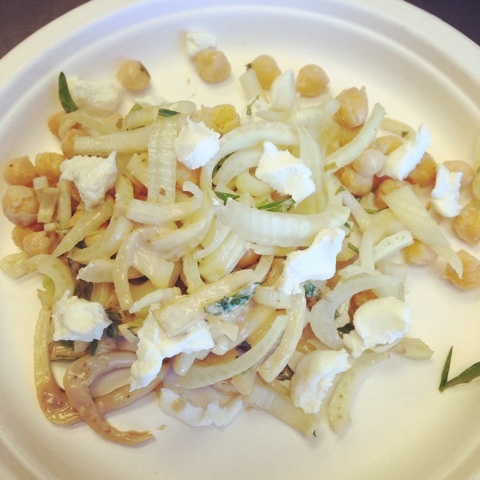 Slightly spicy chickpeas, super cream goat cheese, and crunchy fennel are an awesome combination. And, since fennel keeps much better than lettuce, this is a perfect make-ahead lunch. I'd keep the fennel in one container and the rest of the toppings in another, and then combine right before serving. Toss the sliced fennel with the lemon juice -- this will help avoid browning, if you want to slice the fennel ahead and have it ready to go when you want to eat. When you're ready to serve, toss everything together -- you can adjust the proportions as you like (more chickpeas for more protein, extra goat cheese if you like a creamier salad, more herbs if you like a bit more green in your salad, etc.). Heat the oil in a large skillet over medium-high heat. When hot, add the chickpeas to the skillet. Cook without stirring for a few minutes, until lightly browned on the bottom. Add salt and chili flakes, and shake the pan to combine everything. Cook, stirring as needed, until the chickpeas are nicely golden brown all over. Cool slightly before serving, or store in the fridge in an airtight container. This recipe uses my favorite technique for cooking whole chicken -- rubbing a flavorful butter mixture under the chicken skin -- but with chicken breast on the bone. When it comes to chicken on the bone, I tend to be more of a white meat person, plus everything is done a little faster. Of course, you could also do this with drumsticks or thighs if you're a dark meat person. The other nice thing about this recipe is that sweet potatoes cook in the same time and on the same baking sheet as the chicken, so you don't get too many dishes dirty! 1. Preheat the oven to 435 degrees. Line a large baking sheet with foil and spray with oil. 2. Pat the chicken dry with a paper towel. Very gently separate the skin from the meat. 3. Stir together the butter, mustard, garlic, and salt. Rub half the butter mixture under the skin of each chicken breast. 4. In a small bowl, toss together the sweet potatoes, oil, salt, and pepper. 5. 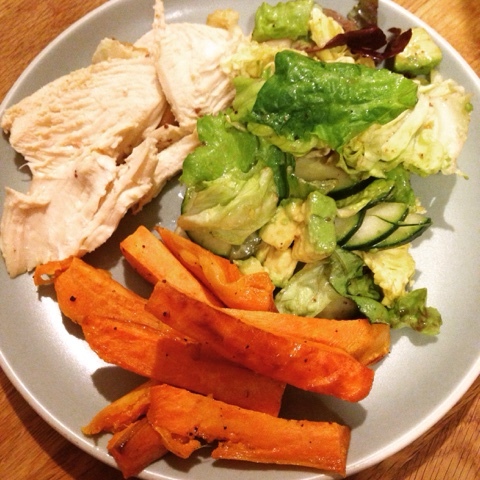 Place one chicken breast on each side of the baking sheet, and arrange the sweet potatoes in a single layer. 6. Roast 30-35 minutes, until the chicken is 165 degrees. This salad is easy and delicious. It's great for dinner, but also packs well for lunch because the greens hold up well in the fridge (in that case, store the croutons and bacon separately from the veggies). The salad feels like a real treat with bacon, eggs, and cheese, but you also get plenty of tasty veggies in your bowl. If you are short on time, you can also prep everything ahead and just assemble when you're ready to eat -- although, I think this is even yummier if all the toppings are warm! 1. Add the kale to a salad bowl along with a drizzle of olive oil and a pinch of salt. Massage the kale for a minute or two, until it begins to break down. Add the radicchio or fennel and toss to combine. 2. Cook the bacon in a skillet until cooked but not too crispy. Blot with paper towels, and cut into small pieces. 3. Soft or hard boil the eggs, according to your preference. If you like soft-boiled eggs, I highly recommend the technique in this recipe in which the eggs are steamed rather than boiled. If you're planning to pack this salad ahead for lunch, you might want to lean closer to hard boiled. 4. 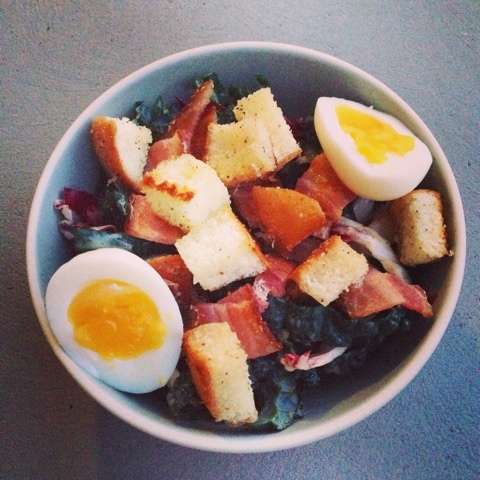 Toss the greens with the dressing of your choice, and then top with bacon, egg, and croutons. 1. Mix together the cheese, salt, and pepper in a bowl large enough to hold all the bread cubes. Set aside. 2. Heat the oil in a skillet large enough to hold the bread, over medium-high heat. When the oil is hot, add the bread cubes in a single layer, tossing occasionally, until the cubes are toasted and nicely browned. Immediately transfer to the bowl with the cheese mixture. 3. Toss well and serve warm or let cool and store in an airtight container for a week or so.